What is a Low Carb/Ketogenic diet? FAT shredding, ENERGY inducing… BOOM!! In a nutshell (pardon the keto pun), its a high fat, adequate protein, low carbohydrate diet (LCHF). When done properly, the results are amazing! At MKb we stress that HEALTHY FATS are key!!! On the ketogenic diet, you’ll munch down most of your calories, approximately 60-70%, from fat. It goes without saying that if you’re eating this much fat, it needs to be HEALTHY, unprocessed with a good balance between Omega 3 & Omega 6 fatty acids. The remainder of your nutritional macros/daily intake should consist of 20-30% protein and 10-20% carbs. Check out the MKb 'what can i eat' blog. When you eat foods high in carbs and sugar, your body produces glucose and insulin. Glucose is the easiest molecule for your body to convert and use as energy, so your body will use this first before any other energy source. Since the glucose is being used as a primary energy source, fats are not needed and are therefore stored. Typically on a ‘normal’, higher carbohydrate diet, the body will use glucose as the main form of energy. By lowering the intake of carbs, the body is induced into ketosis and when the body becomes used to this state, we say it is Keto-adapted, aka “a fat burning machine”. This occurs when you have shifted your metabolism to relying on fat-based sources, instead of glucose sources, as your primary source of fuel. The goal of a properly maintained keto diet is to keep your body in this metabolic state. This also keeps blood sugar levels stable. The best way to do this isn’t through starvation of calories but starvation of carbohydrates. This will transform your body from a glucose burner into a ketone burner. If you eat a high carb, and, yes, even a high protein diet your body will convert excess proteins and carbs into sugar. So your body never gets a chance to use fat as a fuel source. Too many carbs - your body makes sugar. Too much protein - your body makes sugar. And that leads to inflammation and stored fat in your body. Sugar = Fat & Inflammation! Sugar makes you fat! Sugar is the REAL enemy! It is directly converted to fat by your liver and it destroys your appetite control meaning you’ll want to eat more of everything. Big shoulder pads, bigger hair and head to toe fluorescent lycra alternated with a 'shell' suit were surprisingly not the worst trends of the 80s. This decade also birthed the “low-fat” diet craze followed in 1992 by the disastrous ‘Food Pyramid’ above, which promoted bread, grains, cereals & pasta as the dominant food group and limited the recommended servings of meat, poultry, eggs, nuts and oils. 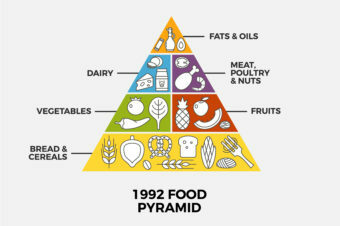 Over 25 years later and we're still trying to fix the 'recommended' food pyramid. Crazy really! Nuts! The notion being that eating less fat would make you less fat. Professor Tim Noakes sums it up perfectly ‘The low fat, high carb diet advice is the worst thing to happen in the history of medicine’. We couldn’t agree more. We’ve now flipped the pyramid upside-down and practitioners of popular diets like Atkins, Pioppi, Keto and Paleo all swear that the key to burning fat is to eat more, not less, of it. So when we’re asked “Can eating MORE fat make me THIN?”…..the scientific answer is ‘yes’. Hooray for science! But let's not be silly about it….. Not all fats are created equally. 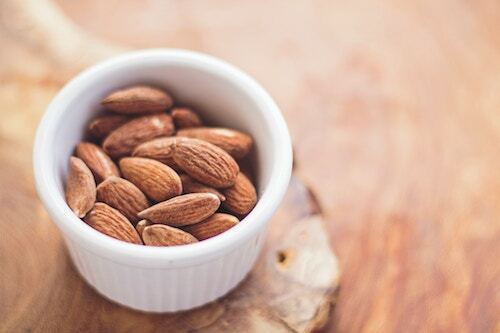 The ketogenic diet involves eating bucket loads of HEALTHY FATS! The more saturated a fat is, the less likely it is to oxidise in the heating process. For example, coconut oil is a saturated fat so is therefore a good cooking oil. If you consume coconut oil, your LDL cholesterol ('bad' cholesterol) hardly increases if at all, but HDL ('good' cholesterol) increases, therefore your ratio of total cholesterol to HDL improves. Good news. Then there's polyunsaturated oils like canola oil, sunflower oil and corn oil. Avoid these as they can trigger the body to produce pro-inflammatory chemicals. Bad news. Fats are not created equal. Good fats are crucial for the brain and body and good fats reduce inflammation. Let fats become your obsession. Eat them, cook with them, supplement with them and get the good versions here. Forget the meat and two veg story that we’ve been told and the food pyramid above. 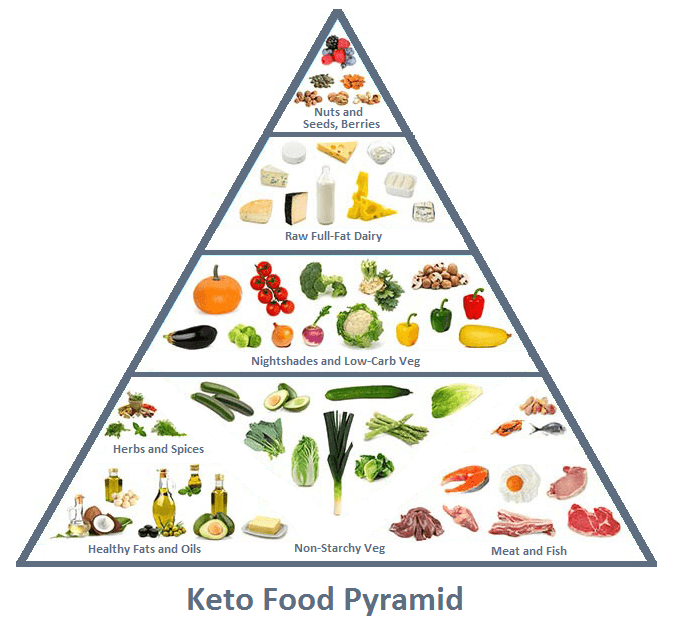 Your diet should follow this Keto pyramid. Ketosis increases fat oxidation and catalyses the break down of fats in the body, i.e. you burn fat quicker! As you transition to using fat for fuel, instead of glucose, you will flush out your glycogen stores and the associated water retention. At the same time, you’ll also be losing your essential electrolytes in that water release. This electrolyte depletion is actually what causes ‘Keto Flu’ and may leave you feeling dizzy, faint and lacking energy. Don’t fret, it will only last a day or so and the outcome is a much healthier version of you. Often people experience one of more of these symptoms and immediately quit and revert back to carbs and sugar. DON'T!! You can combat the Keto flu by drinking lots of water and we like to add electrolytes as they’re full of minerals such as sodium, potassium and magnesium. A strict keto diet can be difficult to stick to so thank goodness for exogenous ketones. EXOGENOUS KETONES get you into a ketogenic state without following a strict keto diet. They also help alleviate keto flu as Ketone Salts contain added electrolytes and some contain MCT oil which keeps you feeling full plus helps your body produce ketones. A diet-induced ketosis from a Low Carb, High Fat intake, especially when combined with the use of nutrition supplements such as exogenous ketones or MCT oil will provide a tonne of energy for your mind and power for your body.